Above all, the choice of a gemstone is a matter of feeling. When purchasing a gem, it is best to study it and compare it to others. 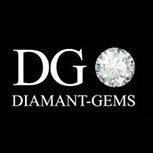 We are at your disposal to organise a presentation of diamonds in our office in either Paris or Antwerp. We welcome you in a secure environment, in complete confidentiality. In order to properly understand your request, an initial meeting is necessary. Our team of gemmologists will advise you and accompany you in your search for a diamond in order to precisely determine your expectations. Consequently, we will be able to present you with a wide choice of stones certified by the major laboratories (GIA, HRD, IGI) to best meet your expectations. You will be able to observe the certificate number engraved by laser on the girdle (edge) of each diamond and the impurities that characterise it with the help of magnifying glasses that enlarges 10 or 20 times. During the appointment, you will be able to appreciate the different colours and sparkle of each stone in ideal conditions (suitable light, colour comparison with the help of ‘standard’ stones). You can also buy a diamond by mail order. You can choose from thousands of diamond certificates that are available online. In this particular case, contact us to find out if the diamond you have chosen is available. A 30% deposit will be required when you place the order and the balance will be paid on delivery. Contact us for an appointment in our offices. We welcome you from Monday to Friday, 9.30 am to 6.30 pm. Our jewellery department is also available to create custom-made jewellery. Once you have defined your project, models will be provided so that you can participate in the creation of your jewellery.